Members of the current Wheel staff on a recent production night. If not for the laptops, any of their alumni predecessors could step right back into the familiar scene, grab a cup of coffee, and start editing. After all these years, they still recall the smell of a deadline. The acrid stench of the waxer, the toner—all the chemicals that went into assembling a newspaper in the days before digital production. The pungent scent of panicky human exertion. The ghostly aroma of someone’s leftover chicken wings. It all played out amid late, late nights fueled by enormous quantities of coffee and stale doughnuts, choreographed to the hum of electric typewriters and the thudding mixtapes of bands whose names would ebb and flow with the decades. But over the years, the echoes of impassioned debate and laughter would remain—the human soundtrack of young people learning by doing, in search of a byline and what was often their first real taste of community journalism. On production nights, the Emory Wheel offices on the fifth floor of the Dobbs University Center are still warmed by the glare of fluorescent lights and computer screens, of too many bodies crammed into one place, and the earnest push toward a shared goal: producing a campus newspaper. For nearly 100 years, a parade of young people have stepped up to lead Emory’s student newspaper, which to this day remains financially and editorially independent from the University. Founded in 1919, the paper was named after an emery wheel, a tool used for grinding and polishing. And indeed, an inaugural editorial in the paper’s first issue pledges to sharpen the intellect of the University community—or at least to attempt it. But to the generations of Emory students who would serve as its top editors, the Wheel is both a laboratory to test fledgling skills and a de facto classroom—a proving ground and a place of belonging, where students learned from one another and cut their teeth on civic engagement. 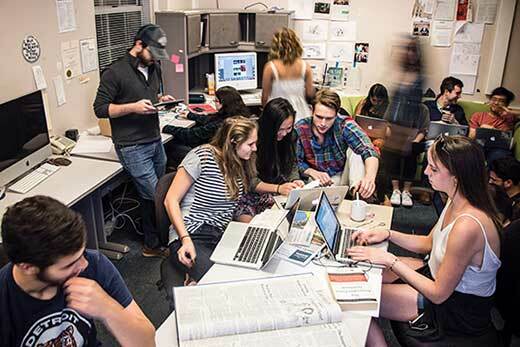 Even as Emory’s formal journalism programs would come and go, the Wheel would endure, powered by youth and curiosity and sheer optimism—a yearning to give back, the desire to make a difference. In this issue, we caught up with former Wheel editors to reflect upon their experience and see where it led them.